With a beautiful book cover and a fitting title, I anticipated a cherished reading experience. Once again, I was inspired and motivated. Read my full review, my interview with author Marilyn R. Wilson and enter the giveaway to win your own copy! In 2015, I read and reviewed Marilyn R. Wilson's first book Life Outside the Box, which I found very inspirational. I was eager, therefore to read this latest addition to her Real People Real Lives series. With a beautiful book cover and a fitting title, I anticipated a cherished reading experience. Once again, I was inspired and motivated. 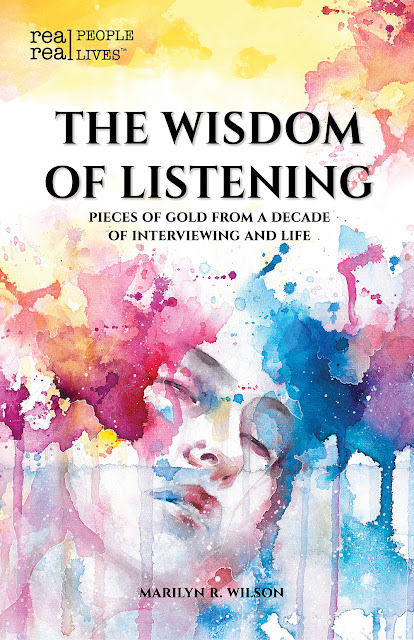 The Wisdom of Listening is easy and pleasant to read, and the wisdom found in its pages makes one stop and reflect so that I took my time to read a few chapters every night. Part memoir, part motivational essays, I thoroughly enjoyed Marilyn's engaging narrative as she shared with us her journey. I could relate to her on so many levels: that of mother, writer, entrepreneur and advocate. Not only do these essays include gems of wisdom, but they are an honest account of one woman's self-doubts, struggles and finally self-acceptance that will resonate with anyone looking to find their way. The essays are introspective, enlightening, truthful, positive and inspiring. If you need a boost in your life, enjoy reading memoirs and motivational accounts, then I recommend this beautiful book. Read with a cup of invigorating tea, it's the perfect set up to what could be the oomph you need to begin a new project, a new career or even a new lifestyle. LCR: Marilyn, thank you for joining us on Library of Clean Reads! Can you describe your book in 30 words or less? MRW: Part memoir, part inspirational – this book offers pieces of gold handed me during interviews and daily life that helped me come to a place of self-acceptance. LCR: Thus far, I've read (and enjoyed!) both your books, written as part of the Real People, Real Lives series. Can you tell us what this series is about? MRW: I have struggled all my life with self-doubt. I didn't' fit in. As I listened to people tell their stories, I was struck by the fact they chose to live a life of their choosing – here it comes – WITHOUT APOLOGY! That was revolutionary for me. So the first part of the equation is wanting to share with others as many diverse stories as possible, to help readers understand that they can choose to embrace their quirks and live a life of their choosing. LCR: Why did you decide to write The Wisdom of Listening? How does it differ from your first book? MRW: I have been sharing the stories of others for over a decade. The dream was always there to write something in my own words, but what? One day in an interview, an artist mentioned that her art was a piece of gold in her pocket that helped her heal and she could share with others to help them heal. I instantly had goosebumps. The Wisdom of Listening became a passion project I set aside for later. Writing it would be my reward after I finished enough “real” books. While struggling to write Life Outside the Box #2, I needed a break. So I sat down just to block out the Wisdom of Listening – title, subtitle, chapter ideas. Instead, the words began to pour out of me. My first draft was done in only three weeks – a process that would normally take me many, many months. It was joyous! The difference? This one isn't someone else's story – it's personal. LCR: This book has the feel of a memoir. Did you intentionally write it to be one? MRW: I am not sure my original intention was for it to be part memoir. I love hearing new stories – not telling mine. However, I feel if you're going to offer words of wisdom in a book, it's important to let the reader know who you are. How else can they judge the validity of what they read? The pieces of gold I offer are shared in a way that let you know where they came from and why they had such a profound effect on my life. LCR: I immensely enjoyed the quotes at the end of each chapter. Are these from a collection you gathered throughout the years or specific ones you searched as you wrote your book? MRW: Some quotes I've had rolling around in my files for awhile. Others I found while looking for something appropriate. Again, I love passing on any wisdom that strikes a chord for me. Closing each chapter this way offers the opportunity for the reader to explore what the person quoted has to offer. LCR: Are you working on another book project? MRW: Always. I have so many ideas for books, I have no idea how many will actually get written. I have two chapters written for Life Outside the Box #2 and new interviews are always dropping into my lap to fill future editions. I want to do a similar book on interesting people in the fashion world such as the Colombian designer who found the indigenous tribe of her ancestors and hired them to weave and dye her cloth. I also have a few submissions book ideas in which I would compile submitted stories. LCR: Where do you see yourself in 5 years from now? MRW: This is a great question as I've been asking myself this for awhile. I am ADD and usually change directions every 4-5 years to keep from being bored. However, I have been interviewing and writing the stories of others for 12 years now. I feel a change coming, but I'm not sure what it will be. I love the exhilaration found in learning new things and facing new challenges. There is no rule that says you have to do the same thing forever, even if you are good at it. I am always poised and ready to open a new door and take a leap of faith. LCR: What do you hope your readers will get from reading The Wisdom of Listening? MRW: I get goosebumps even reading this question as it's so important. I want readers to embrace the knowledge that they are exactly who they are meant to be. They do not need to change to fit social expectations. Their quirks are their talents and will lead them to their passion. I also want them to realize diversity is what makes mankind unique and is our greatest strength. It's what moves us forward. Let go of fear and fill your life with a wide range of interesting people. It will be life changing. LCR: Any pieces of gold for those wishing to write a non-fiction motivational book? MRW: Be strong. This industry is in a state of change, so you must be driven and have a thick skin. Fiction books of all genres have an easier target audience – not easy, easier. Non-fiction does have “hot topics” with a set audience – diet, exercise, addiction, etc. - but outside of that it can be difficult. Most really successful non-fiction books outside of “hot topics” are written by people in the public eye, or by people running workshops and speaker series. That doesn't mean it's impossible. It only means you must be very focused, very determined and willing to step outside the box to find your readership. LCR: Thank you so much Marilyn for chatting with me! Since 2006, she has interviewed over a hundred and fifty people from around the globe, co-owned a local magazine, wrote freelance for others, worked as an editor, published two books and provided author support for her publisher. Her goal as an author -- to give wings to the stories of others and to pay forward some of the many "pieces of gold" received during interviews - bits of wisdom that have changed her life. This book would be a wonderful treasure which I would appreciate and cherish greatly. Thanks. You're right in saying that this book is a treasure. It's a keeper on my bookshelf. I really like this unique cover! Sounds like a good read! Sounds really good. Great cover. This sounds like one that will keep me reading. What a great cover and I would love to read your book.